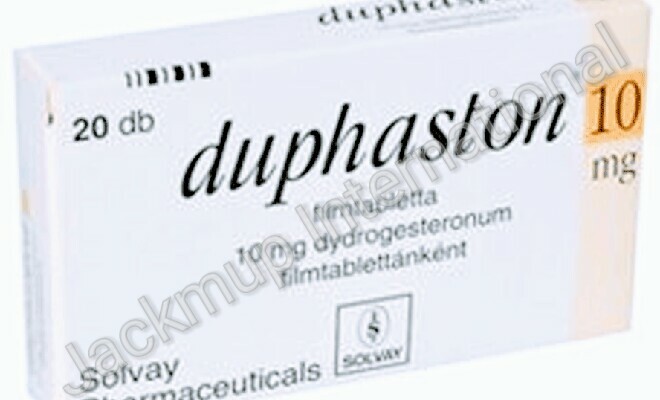 Description:- Duphaston 10 mg tablet is used in hormone replacement therapy (hrt), premenstural syndrome (pms), female infertility, amenorrhea, mennorhagia and pain during menstruation.It is a drug which is very similar to female hormone progesterone that is naturally produced by the ovaries. It works by replacing progesterone in conditions where the body fails to produce sufficient amounts. If you have abnormal bleeding, the cause of which is not known. If you have depression. If you have porphyria (a rare blood pigment disorder that affects skin and other organs). Continues for more than few months. Starts after you have been on treatment for some time. Persists on even after you have stopped treatment. Do not take dydrogesterone in combination with estrogen (as a hormone replacement therapy) if you have breast cancer or cancer of the uterus lining (endometrium)Do consult your doctor before using dydrogesterone if you are pregnant or planning to become pregnantDo not take dydrogesterone, if you are breast feeding or plan to breast feed. Side Effects:- Adrenal insufficiency, Rash, Vaginal discharge, Headache, Dizziness, Back pain, Increased appetite, Decreased libido, Pain in extremity, Abdominal distension, Cushing syndrome, Sleepiness, Vomiting, Nausea, Edema, Abdominal pain, Lower abdominal pain, Breast pain, Hair loss, Fatigue, Acne, Hot flushes, Thrombophlebitis, Diarrhoea, Irregular menstrual cycle, Cushingoid syndrome, Increased blood pressure, Depression, Mood changes, Nervousness, Constipation, Increased glucose level in blood, Breathing difficulty.